Kanchenjunga's dominating peak is so high that a trek to its base camp is itself a big-time adventure that keeps kicking the adrenaline rush. Trekking trail to Kanchenjunga Base Camp is quite different when we compare it with the other treks in the Indian Himalayan belt. Kanchenjunga massifs contour a big cross that spans the boundaries of three major countries- Nepal, Tibet and India (Sikkim). 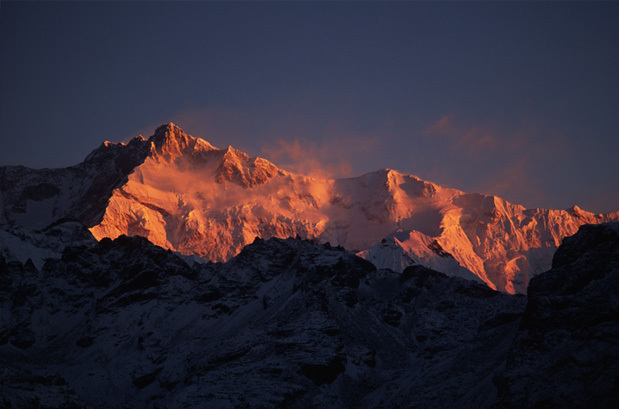 Till 1849, before the discovery of Everest and K2, Kangchenjunga was deemed as the highest mountain in India. As per the geographical facts, Kangchenjunga along with its five great massifs forms the third highest peaks in the world. These five massifs are. As per the geographical facts, Kangchenjunga along with its five great massifs forms the third highest peaks in the world. These five massifs are Himalaya in Sikkim region started witnessing heavy footfall in the year 1988. Initially, trekking in the area was restricted so as to preserve its ecosphere. Slowly the explorers unfolded the remote valleys and the hidden treasures - lakes, tribal villages, and forest embedded with a variety of flora and fauna. The thrilling trek to Kanchenjunga base camp originates from Yuksom; further, it continues towards Bakhim, Dzongri, Laxmi Pokhari, Bikhbari Chaurikhang and Rathong Glacier, Bikhbari and then finally ends at Bakkhim. Within the 11 days expedition, trekkers will enjoy the astounding view of Mt Khangchendzonga (8,586 m), Mt Kokthang (6,148 m), Mt Pandim (6,691 m) and several other peaks in the region. Isolated villages, high verdant, gleaming mountains blanketed in snow, misty clouds forming a canopy around magnolia and rhododendron forest and dramatic landscapes, makes Kanchenjunga BC Trek a perfect platform for trekkers. Book your seat now for this exciting trek. See below for the complete itinerary. Relish the panoramic view of the neighbouring mountains - Frey Peak (5830m), Koktang (6,148m), Kabru Peak (7,412 m), Ratong, Chandra Peak and the Kabru Dome (6600m). Meet and great people of remote villages. 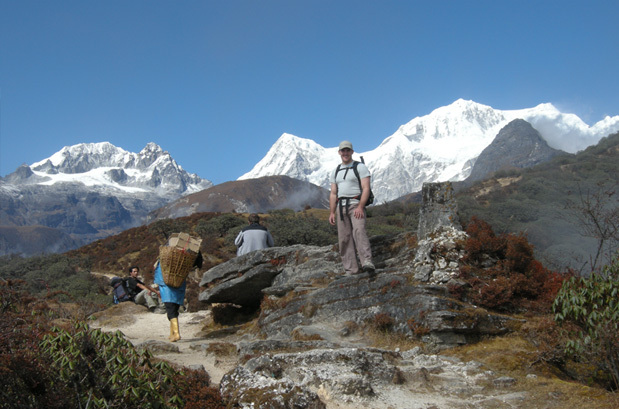 Trek to the base camp of the third highest mountain in the world is an experience to remember. Take a tour of a Sikkim tea garden, learn about the various kinds of teas, and spend some time in the midst of nature. 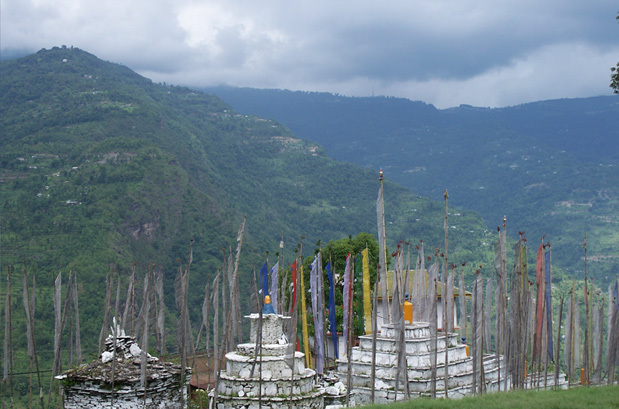 Explore the colourful culture of Sikkim by going for a monastery tour. Trekkers should avoid going for trekking during the monsoon as the trails get slippery and roads remain blocked due to torrential rains. In the winter season, the trekking is often impossible as it snows heavenly and trails become inaccessible and weather quite foul. Dzongri Day: 2°C to 7°C. Since trekking requires covering large distances, usually by walking up and down hills and mountains, it is necessary that the trekkers should be physically fit. Altitude acclimatisation is thoroughly necessary as the air gets lighter and with lower oxygen beyond Dzongri. 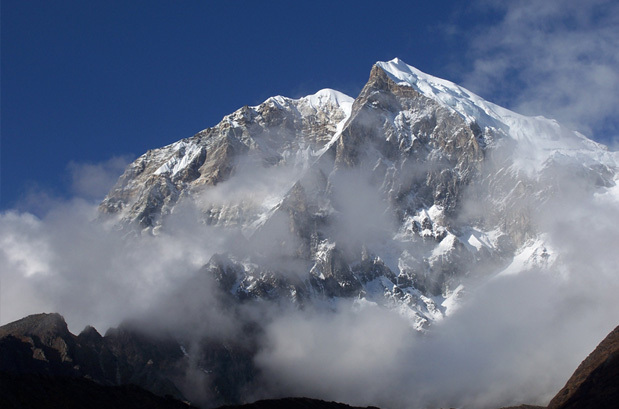 Where is the Kanchenjunga Base Camp Trek ? Standing tall at an elevation of 8586 m (28169 ft), Kangchenjunga is the third largest mountain in the world and contours a giant cross that spans the boundaries of Nepal, Tibet and the Indian state of Sikkim. The towering peak is located in the large portion of Himalaya called The Kangchenjunga Himal, which is spread over 7,000m (23,000 ft). Three main sections of the mountain out of the five - Main, Central and South, are located on the border between North Sikkim in India and Nepal. 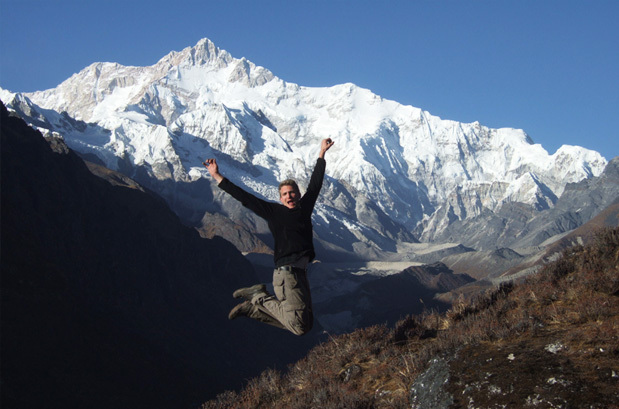 How to Reach Kanchenjunga Base Camp Trek ? By Roadways : Tourist can reach Yuksom within 5 hours from Geyzing (44.9 km) using shared or private jeeps. Gangtok (145.9 km) and Pelling (35.9 km) are the other nearest places where you can arrive via buses or jeeps available at Yuksom. It might be difficult to find shared jeeps after 1 PM. By Railways : The closest railway station of Yuksom is the New Jalpaiguri railway station, around 150 km away. By Airways : The nearest airport is the Bagdogra airport, which is around 160 km from Yuksom. Board an early morning flight to Bagdogra airport. After arriving in Gangtok, meet our guide who will help transfer you to Gangtok and check into the hotel. Dinner and overnight stay at the Gangtok hotel. After breakfast, you will drive to Yuksam for overnight stay and dinner. Kick start your day with a healthy breakfast and head to your destination for the day, Tsokha. The trek will begin at a local market; then the trekkers will have to cross four bridges and climb steeply towards the northeast to reach Bakkhim. The trail will continue for another three km and pass through the magnolia and rhododendron forest till Tsokha. Dinner and overnight stay in Tshoka. 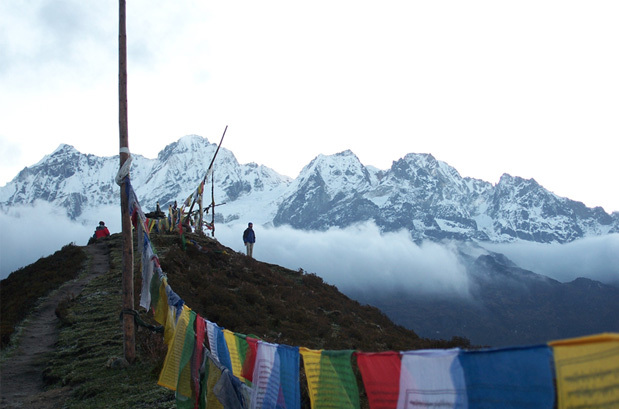 Early morning, you will be guided to alp of Phedang (3650 m). After crossing alp of Phedang, you will start your trek to Dzongri, which will be the campsite for the overnight stay and dinner. Rise early and shine, today you will have to trek uphill till the ridge to chase the dawn. The view of the sun gliding above the mountainous horizon is breathtaking. Also, you can enjoy the astounding view of the neighbouring peaks - Kanchenjunga (8,586 m), Kabru (7,000 m), Pandim (6,691 m), Rathong glacier, amongst other. After few steps, you will trek along the rhododendron bushes and pasture land, till you reach Chamaray. From Chamaray, a steep uphill climb might land you to Laxmi Pokhari, which will be your camping site for the day and dinner. On this day, the trail goes to left side to reach Zamlingang. Dinner and overnight stay in Zamlingang camp. 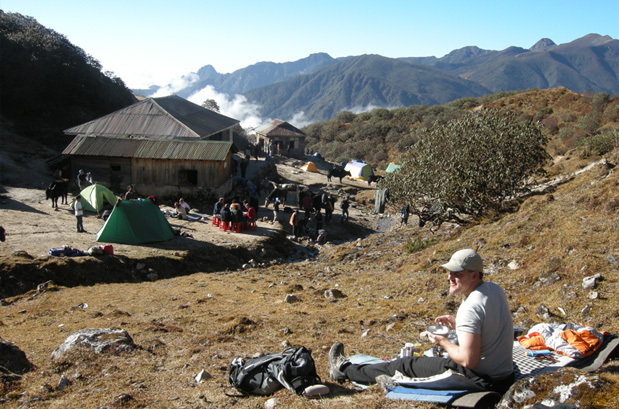 Today is going to be the day for what you have been waiting, trek to the Kanchenjunga Base Camp. Early morning, get ready for a trek to Kanchenjunga Base Camp to see the stunning view of the Frey's peak (5830 meters), Koktang (6,148 meters), Kabur and Rathong glacier. Spend some time there and come back to Bikhbari for camp and overnight stay. This day can be spent at leisure to save your strength for the next day. Lap up the charming settings that abound. If you wish, you can explore the vicinity nearby. Retreat for the night in tents. Early morning, start trekking downhill to Bakkhim for overnight stay and dinner. After breakfast, trek downhill to Yuksom. Upon arrival, you will visit the Dubdi monastery for lip-smacking lunch. Overnight stay and dinner in Yuksom camp. 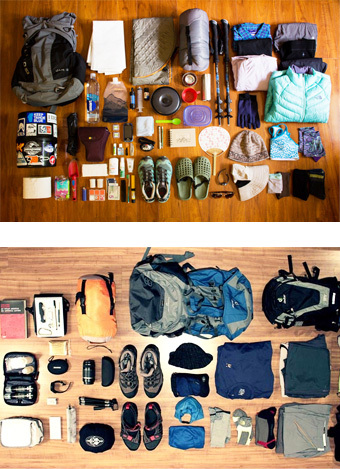 Wake up in the morning, pack bags and get ready for the Bagdogra airport to board a flight to your respective cities. With the transfer to airport, this incredible Kanchenjunga BC Trek will come to an end. 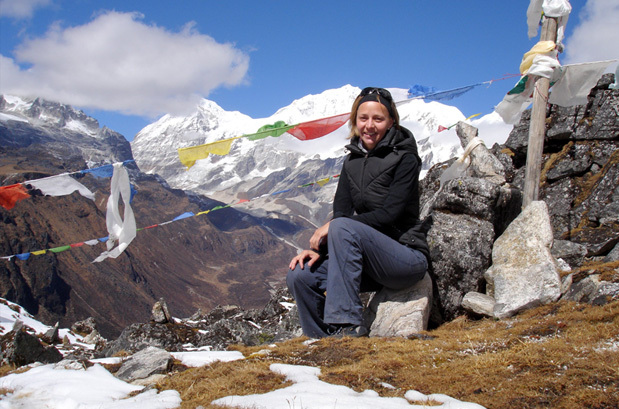 When to book Kanchenjunga Base Camp Trek ? 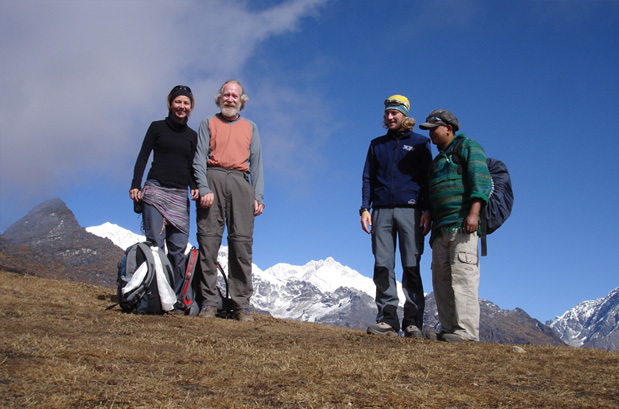 You should book Kanchenjunga BC Trek well in advance so that you get ample amount of time to prepare for the trek. 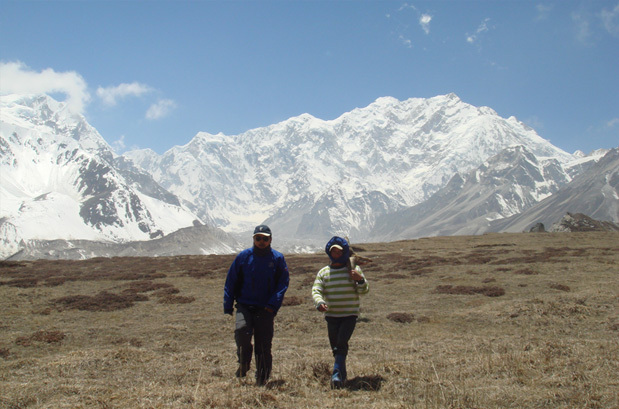 What is minimum age required for Kanchenjunga Base Camp Trek ? 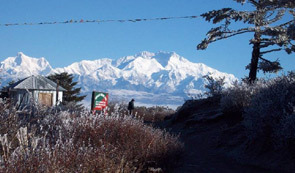 Kanchenjunga BC trek is a moderate trek with a maximum altitude of 17060ft (5200m) minimum age required is 15 years. 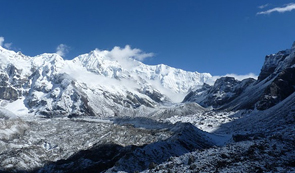 What will be the minimum temperature during Kanchenjunga Base Camp Trek ?